Ladyblush: Carrying off the Wide Legged Jeans! Skinny jeans are an obvious closet staple. Synonymous with the phrase, "oh, I just threw this on," there isn't much they don't work with — except perhaps this 100-degree, sidewalk-melting heat. But if you can't wait until fall to don a pair of jeans, we suggest you turn your attention to the wide-leg jean, instead. Yes, this shape has been blustering 'round our ankles for a while now, but we definitely see the cut sticking around for the fall season — and beyond. Comfy, flattering, forgiving, breezy…and super-chic when you style 'em right, these guys help create the perfect silhouette for any transitional look. And we got your back, too, with three awesome ways to wear them. Who says jeans don’t work in the office? With a killer loafer or blocked heel, a smart silk shirt and a seriously statement bag, who’s gonna know you were wearing jeans?! 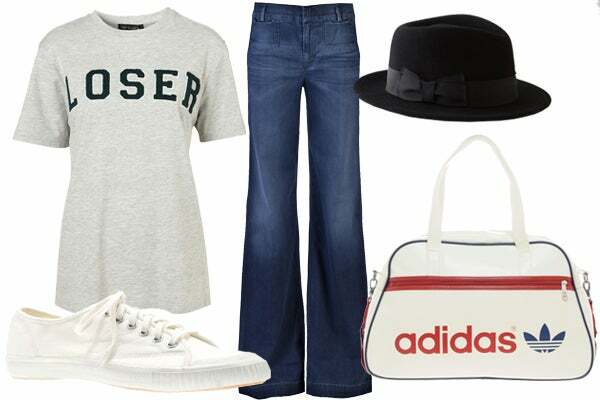 With the games in full swing, show your support for the team with a sports-inspired look. Team with cute espadrilles or sneakers and a preppy tee for lazy Biergarten afternoons.